Do you want to learn more about the path to become a judge? As one of the highest honors in the United States justice system, a career as a judge is certainly a worthwhile dream. Typically, judges start off by earning a law degree along with several years of experience. They must be appointed or elected into their positions by community officials, a process which varies depending on jurisdiction and type of court. Read on to learn more about the steps to take to become a judge in the United States. The first step to becoming a judge is to complete your undergraduate education, followed by a law degree. Law school typically takes three years to complete, beyond your bachelor’s degree. Courses required include constitutional law, contracts, property law, civil procedure, and legal writing. After graduating law school, you must pass the comprehensive bar exam in order to become licensed to practice in your state. Because judges must be appointed or elected into their positions, most have many years of experience as lawyers during which they have gained political support, it’s essential that you practice law if you are interested in one day becoming a judge. The process through which judges are appointed or elected varies from jurisdiction to jurisdiction as well as among type of courts. 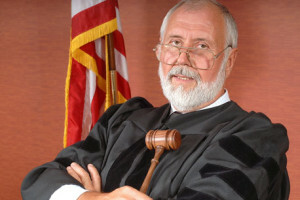 Typically, terms for judges range from four to 14 years, while some, such as appellate court judges, are nominated for life. Some types of judges, specifically federal administrative law judges, must pass an exam given by the federal Office of Personnel Management. To become elected or appointed, you should become a prominent lawyer within the community where you one day want to become a judge, and focus on gaining political support from local leaders. Judges earn an average annual salary of $115,760. While most work full time, some must work additional hours and be on call for emergencies on evenings, weekends, and holidays, others work part time while continuing to practice law or other pursuits. The need for judges will remain steady and the competition for these positions extremely steep, since a new judicial position must be approved by legislature and only opens up when someone leaves the occupation because of retirement, to teach, or because it’s the end of their elected term. Judges must have superior reading and writing skills, as well as being extremely adept at critical thinking, listening, and decision making. Because of the extensive work experience and community support required to become a judge,this is not usually a traditional career path. It is more often that people aspire to be lawyers and turn their sights on becoming judge as they progress through a legal career. While the path to become a judge may seem arduous, it is a dream that is well within reach for those who are diligent, politically savvy, and have a true appreciation for and commitment to serving justice. Related Resource: Is Graduate School Required to be Successful in the Criminal Justice Field?